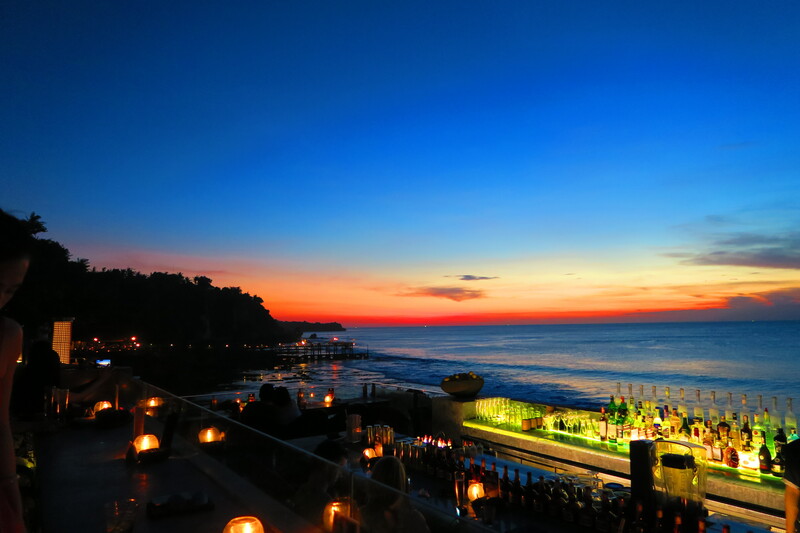 For my 30th birthday last year, my partner surprised me with a gift I had been dreaming about forever, but had never really thought was a possibility – a stay at the five-star Ayana Resort on the Jimbaran coast of Bali. 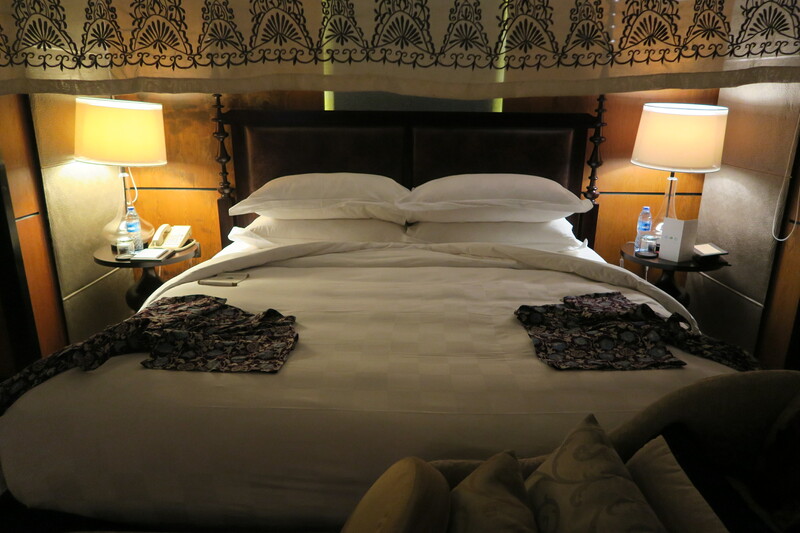 Considering we are budget backpacking, which means scrimping and saving as much as we can the make this trip last as long as possible, staying in places that leave a lot to be desired, the idea of a few days of pure luxury seemed unimaginable. Ayana Resort picked us right up from our hotel in Kuta and within 30 minutes we were pulling up to the front gates of the resort. 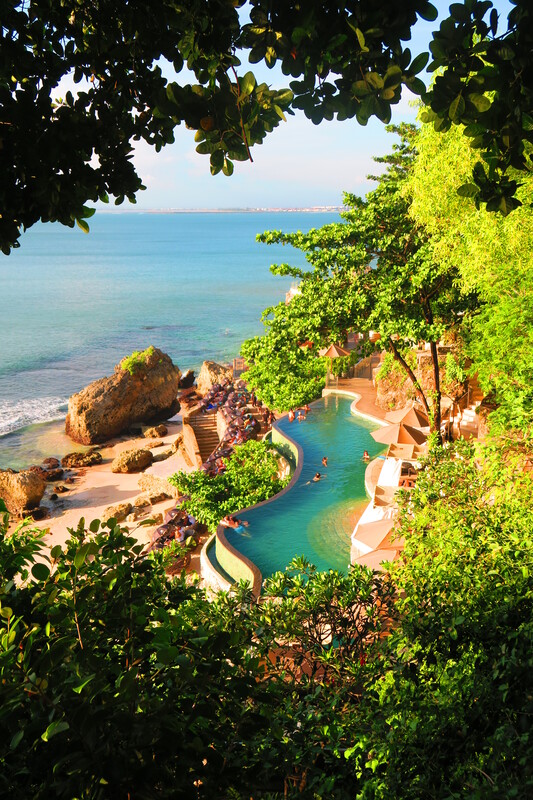 It seems crazy to drive past dirty, old, rickety buildings and houses, and into the elaborate front entrance of Ayana – it just goes to show the disparity between resort life and regular life here in Bali Indonesia. I still look at these pictures and can’t believe it was reality!! 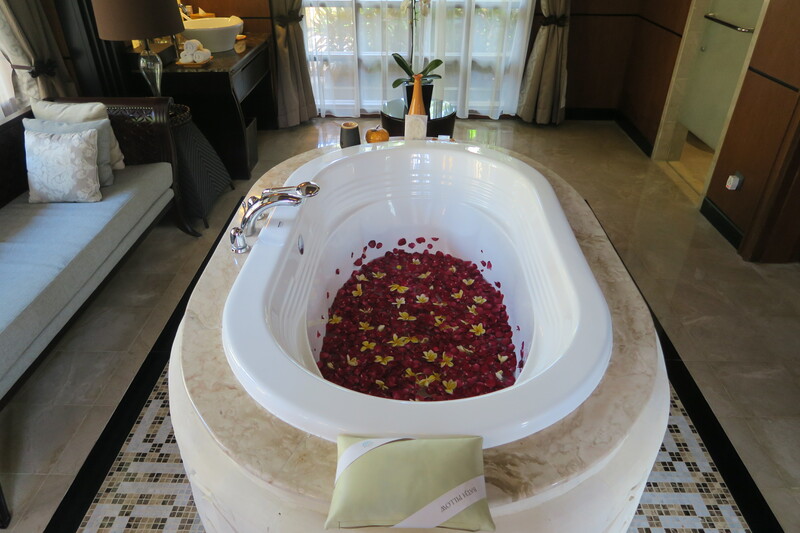 – Plush tiled bathroom the size of most houses, with huge bathtub filled with rose petals and frangipani, separate toilet, separate rainfall shower, his and hers vanity, another chaise lounge, and an exit out to the outdoor shower. 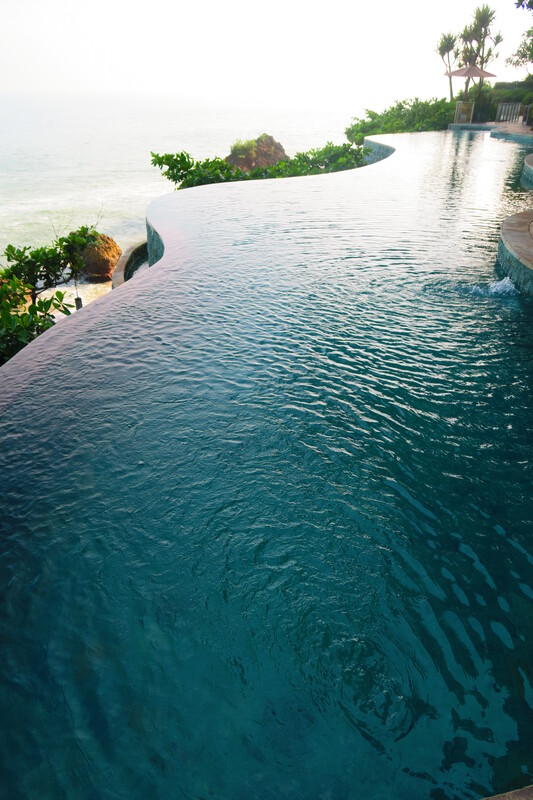 – Private infinity pool and day bed looking out to the ocean. This was all made even sweeter by the addition of the three other main swimming pools on the property, the private beach that the resort owns, and the plethora of amazing restaurants on site. The entry fee was Rp. 20,000 each – you have to have your knees covered here, so they wrap a sash around your waist (this is included in the fee). We didn’t bothered with a guide, but you could for around Rp. 40,000. 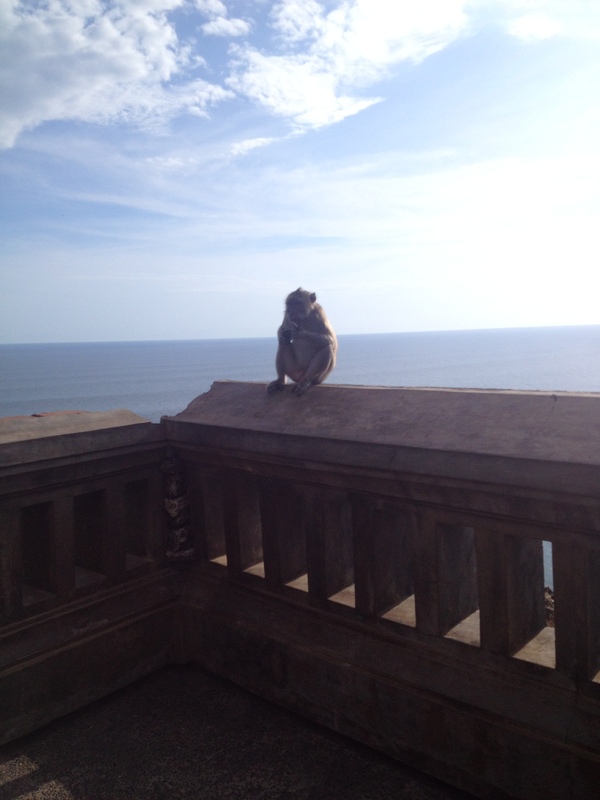 The only time I did wish that we had employed a guide was when the notoriously naughty monkeys got a little too in your face, stealing everything from water bottles, sunglasses to the sashes from peoples waists. 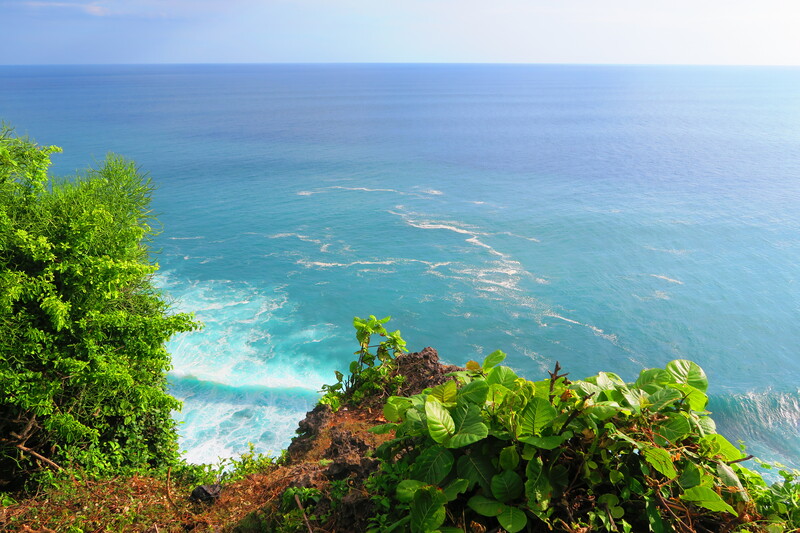 A 30-minute walk from the temple brings you to Uluwatu village – a windy, terraced township right on the cliffs overlooking the ocean. 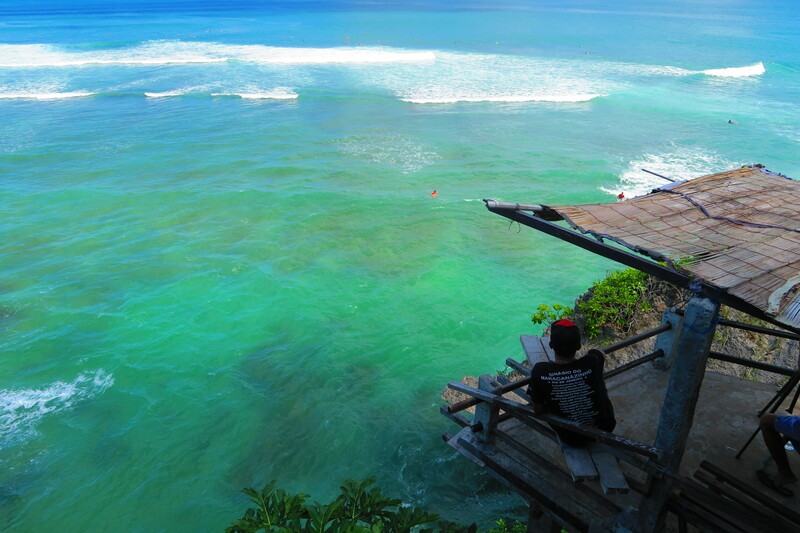 Every person I know who surfs has either already surfed Uluwatu, or dreams of making it here. Even for myself, who has tried surfing three times now and can’t seem to get it right, spent hours watching the surfers master the waves. Definitely worth the morning being a spectator if nothing else! 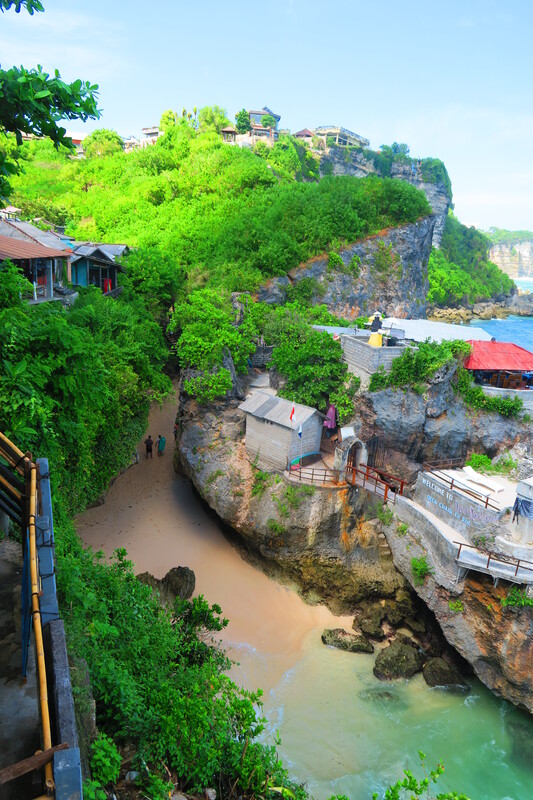 The following day we went from Uluwatu to Nusa Dua, making our way through village main streets and markets, taking all of an hour or so. 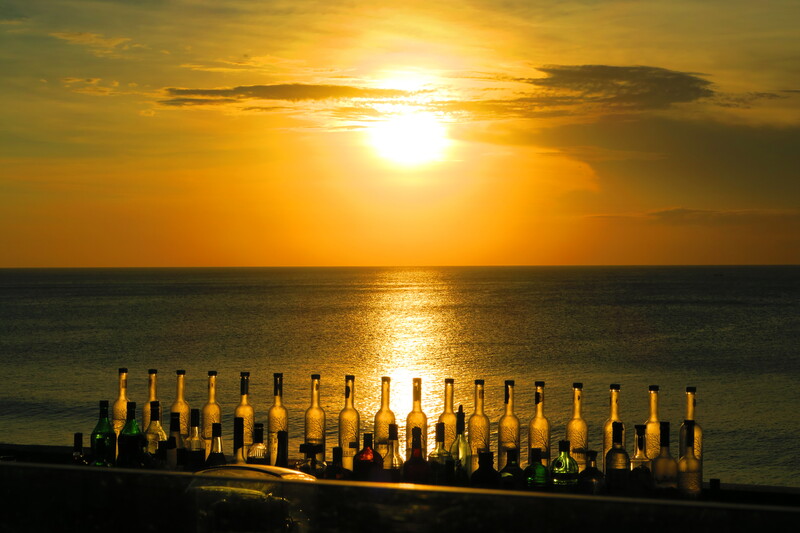 Nusa Dua beach is one of the best in Bali. 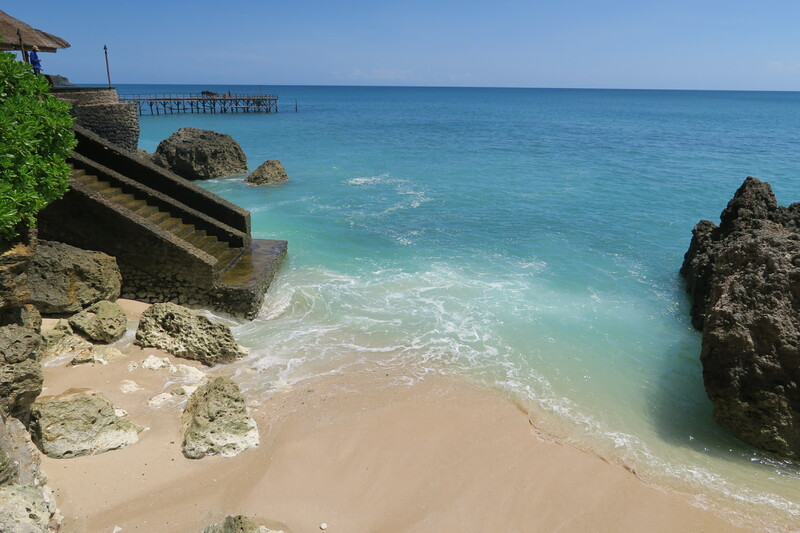 So many of the beaches around Bali are either filled with garbage (see Kuta beach), or too full of coral or rocks to be great swimmable beaches (see Medewi beach). The white sand of Nusa Dua and gentle harbour-like tide is perfect for a day spent laying in the sun and swimming when it gets too hot. Fancy resorts line the main beach, meaning that if, like us, you aren’t spending too much per night on accommodation and had to book further away from the ocean, accessing the beach can be a little but more difficult. There are very few beach accesses unless you’re in a resort. 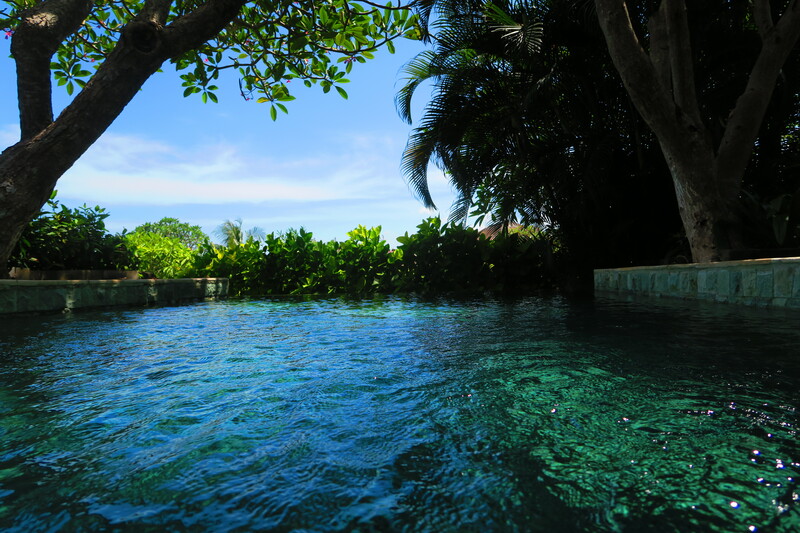 My advice would be to stay further north of Nusa Dua beach, in Benoa Bay, where accommodation is a little bit more wallet-friendly and you might be able to have an easy walk to the beach. Nusa Dua also boasts a large outdoor-style mall, Bali Collection. If you need souvenirs, Bali art, or maybe just some new swimmers – here would be the place to go. 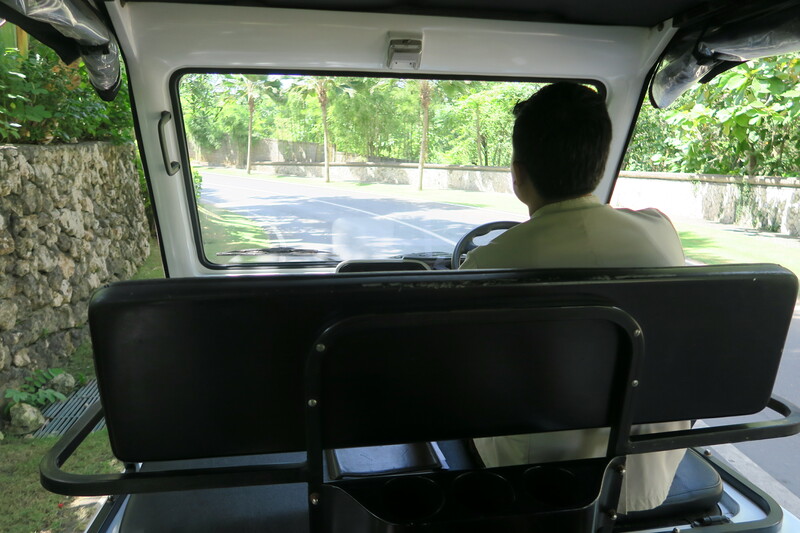 The mall itself offers complimentary hotel shuttle service for some of the bigger resorts and hotels… I, of course, just walked. 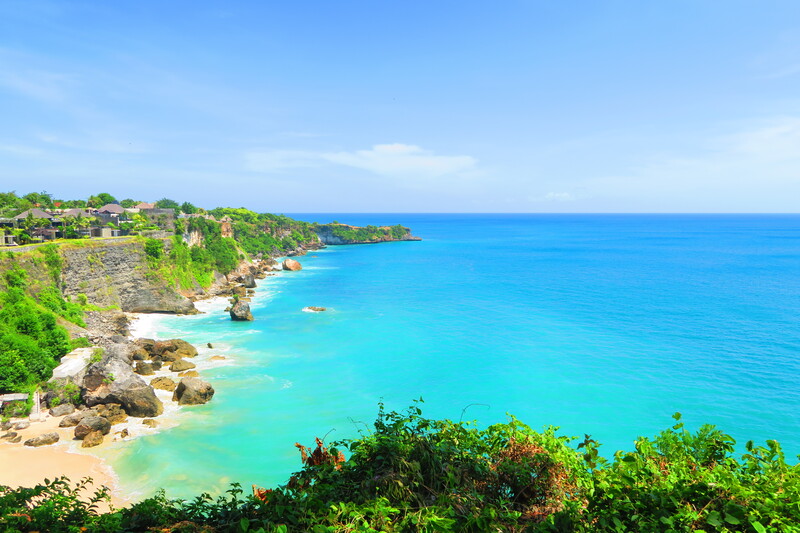 South Bali really has something to offer everyone: surf, swimming beaches, shopping, resorts, and all within an hours drive from Denpasar airport (especially given the toll expressway that connects the two). Things are a little more expensive down South, but there’s a reason for it – you get what you pay for in terms of location, luxury and service. As I’m sure will continue to happen during our travels, I wish I had more time to spend exploring this area! 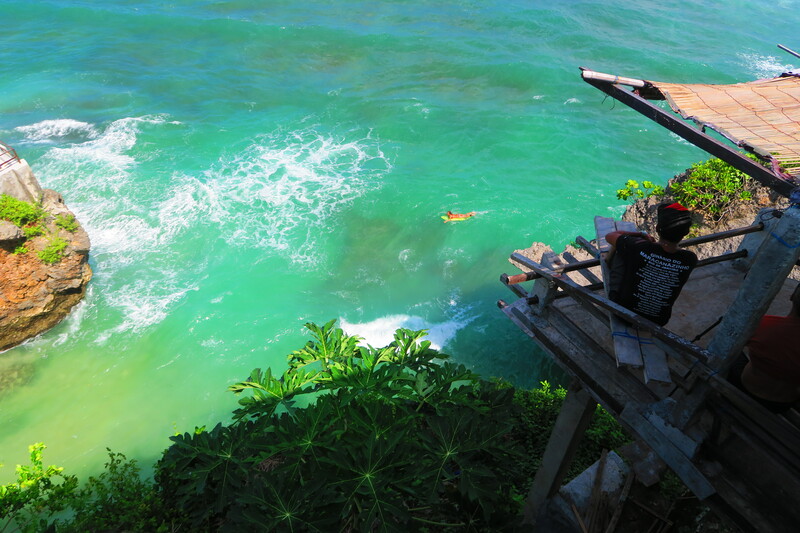 Been to Uluwatu? Nusa Dua? Any stories from your time there, I’d love to hear from you!